We didn't go far inside, not that there's very far to go. 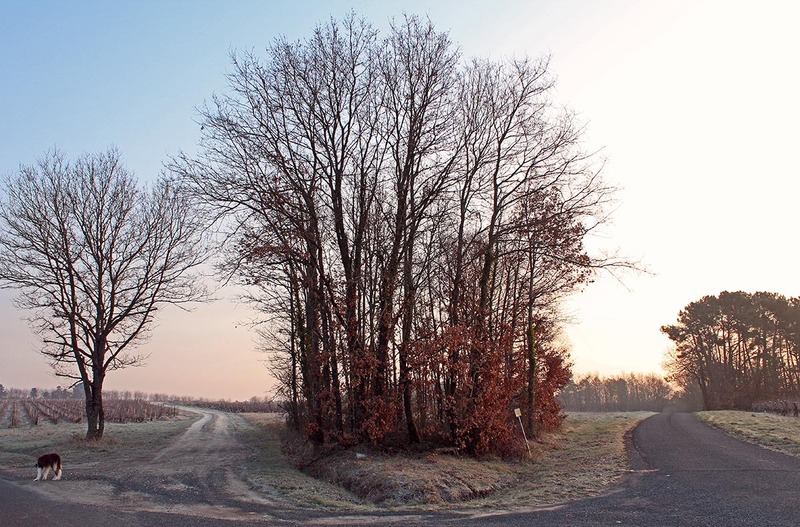 Just beyond the wood is another road. Beyond that, a ravine, then another ridge planted in vines. Callie and I stayed in the margin, threading our way along the paths between tree and open land. Looking back out of the wood toward the vineyard. 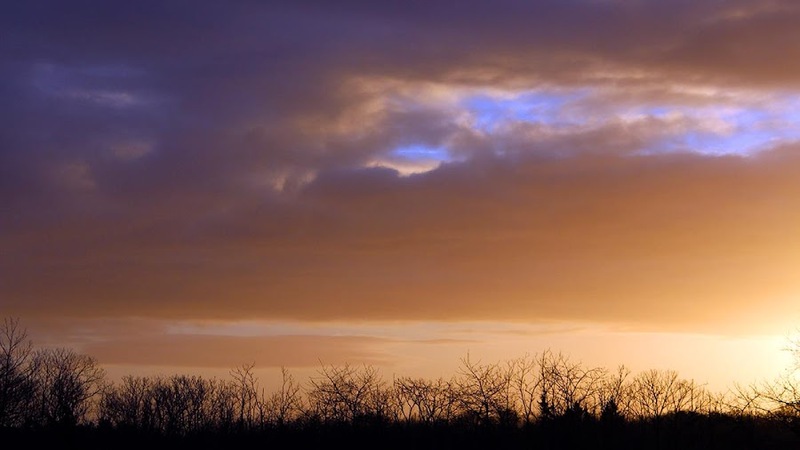 The overcast thickened as the sun moved closer to the western horizon. I wished I had brought the tripod along. My pictures would be a bit fuzzy in the fading light. Callie kept on, sniffing and searching for deer, but she stayed close, not wanting to lose me. Up toward the end of the vineyard road, beyond one of the vine parcels, stands a small patch of pine trees. 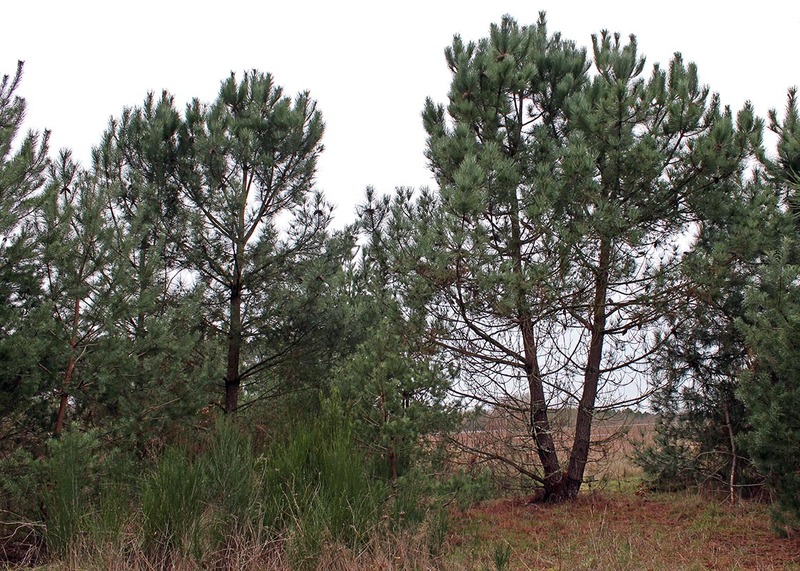 At its edge, where the pines give way to a small lot of tall grass and then to grape vines, young pines, no doubt sprouted from seed, advance toward the empty field. In this margin are countless small trails made by deer, foxes, rabbits, and other inhabitants of the local woods. A well-trodden path through the tall grasses toward the woods. Callie and I ventured through this transitional wood one recent afternoon. The dog is no stranger to this spot; she loves to wind her way around the trees following this trail and that, sniffing for signs of other animals while I, much less nimble than she, keep to the parallel dirt road. 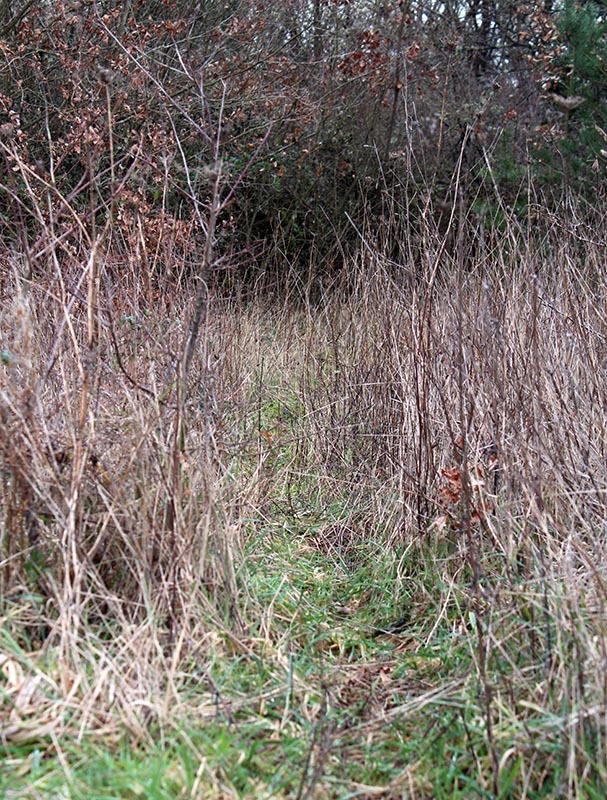 She chases deer into these woods frequently and must believe they're all still there, hiding just inside. When I followed her in on this day, I saw a happy smile on her face. She led me on, sharing one of her special places with me. The moon was actually full on Sunday morning, but clouds prevented us from seeing it. 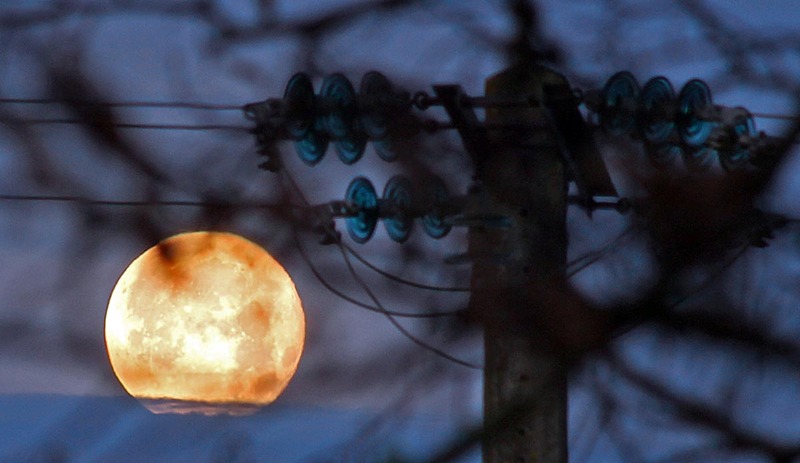 But on Monday we had some breaks in the clouds as the just-past-full moon set in the west. I scrambled to get the camera set up (tripod, long lens, memory card) at the window for some photos. 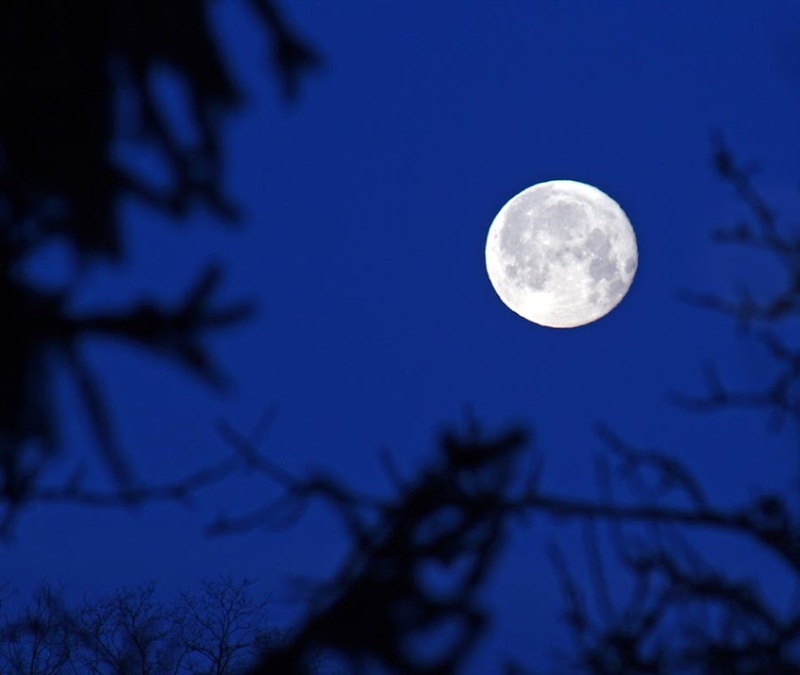 The moon, 28 January 2013, 08h10. This is the best of the bunch. I like how the sky came in deep blue. The sun was not quite up yet. The official sunrise was at 08h25, fifteen minutes after I took the picture. Compare it to this shot I took one month ago. 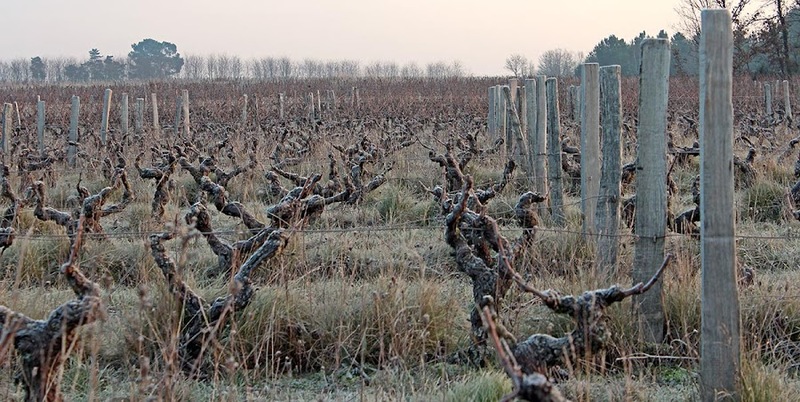 Here's the last of this current series from the frosty vineyard. I took these pictures before we got our snow last week. The snow is now long gone and the temperatures have warmed up. We haven't had a frosty morning in a while. I should do a series called "muddy vineyard." One of the last clear mornings in recent memory. The ground was frozen. No mud. Seriously, all the bare ground is mud right now. Even the grassy bits are spongy. I avoid low spots on my walks with the dog. They're just too wet. We need a week or two of bright sun and no precipitation. Ha! 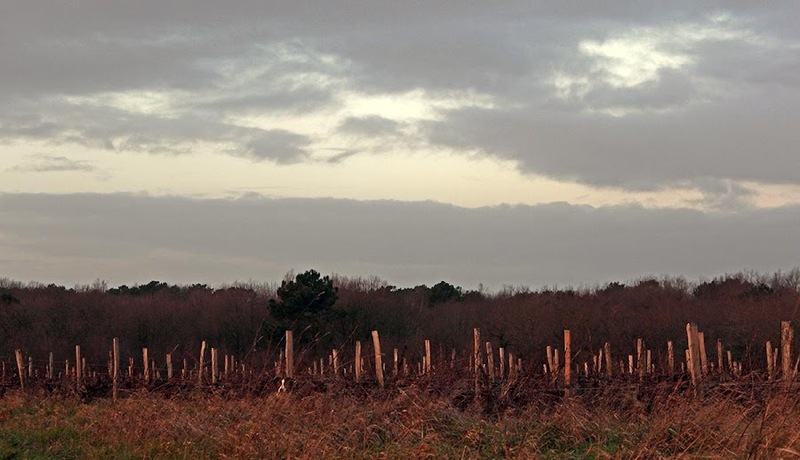 I know it's a bit samey, but here's yet another view of the winter vineyard. The bit of snow we got on Saturday morning disappeared rather quickly. This morning it's trying to rain. The forecast is for actual rain mid-day with some wind gusts. The vines in the foreground have been pruned, the vines in back have not. According to a schedule Ken found on the internet last fall, today is the last regular hunt day of the season in our area. I believe that means no more hunting for pheasant and hares and maybe other small game. The season continues through February for roe deer, boar, and fox. Those critters are usually hunted in organized hunts called battues. All seems back to normal, computer-wise. Better than normal, actually. I'm enjoying not having the slow-down problems I was having with the old machine. So, Ken and I had Christmas in January. He got his new tablet and I got a new desktop. Ho, ho, ho! Callie checks to see if I'm following her down between a row of vines in the frosty vineyard. This morning I'll be watching the women's tennis final from Melbourne, live on television. We've been getting the night sessions live in the mornings, then they switch to matches recorded during the night. Sunday morning I'll see the men's final, which promises to be a good one. The Federer/Murray semi-final was fun to watch yesterday. I'm still playing working with my new computer to get it set up and customized. There is so much new stuff to explore and figure out. The basics are working fine, but I'm making tweaks here and there as I learn the new system. 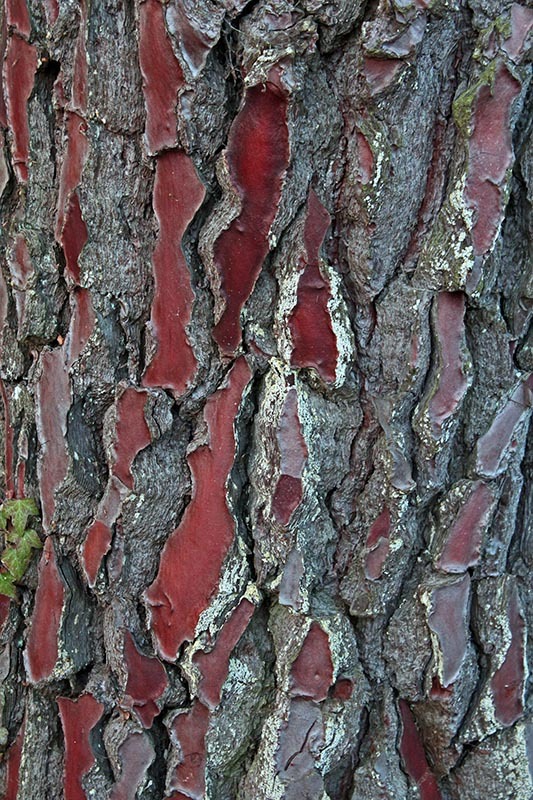 The colorful bark of a nearby pine tree. I'm not taking time to respond to comments right at the moment, so please bear with me. I am reading all of your comments, of course (and thanks for all the info and advice! ), and appreciate them. I got the den cleaned up yesterday and the old computer is moved to a different room. It's set up and running in case I need it, but it's out of the way for now. I spent most of Wednesday working on setting up the new computer. It's mostly figuring out the new Win 8 start screen, setting things up, personalizing, and installing the programs that I use. Oh, and recopying my data from their backup devices onto the new hard disk. Looking west (again) across the rows of vines. These aren't pruned yet. It's going well and I'm pretty much done. Soon I'll unplug the old computer for good. I haven't turned it on yet this morning. I want to work from the new one until I find something that I forgot. Those television commercials for Dell Computer featuring Steven the surfer dude seem so long ago. I guess they were, since they were on in the early 2000s. That's ancient for advertising. And computers. My current computer, a Dell Dimension desktop, is now nine years old. I got it in 2004, nearly a year after we moved to France. My prior computer, a Dell Inspiron laptop, was on its last legs then. 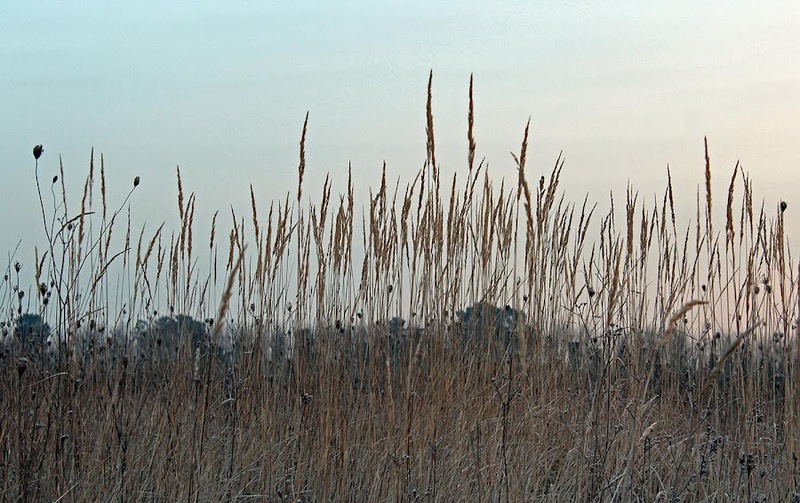 Dried grasses and wildflowers in the winter vineyard. For the past year, I've noticed my computer slowing down, especially with internet surfing. I know that my hard disks are old enough for me to be worried about them crapping out at any moment. I've been diligently backing up data and photos just in case. But I know that my soon-to-be ten-year old technology is not going to be practical much longer. So Ken and I did some research and last week I ordered a new machine: a Dell Inspiron Slim desktop. I like the look of the smaller box; it won't be so bulky in the den. The new machine has a new generation processor and a terabyte of disk space, more than my current two drives together. The computer arrived yesterday and I'm getting it all set up and ready to use now. I'm learning the new Windows 8 system in French (my previous Windows 7 system is in English). So, this may be the last blog post from the old computer. You won't notice any difference when I switch, but I sure will. The snow is melting away quickly as the next weather system rolls in with (slightly) warmer air and drops rain on us. And that's fine with me. Still, we must keep an eye on things as the temperatures rise above and, more importantly, dip below freezing. All that water on the cold ground can become ice in a jiffy. Looking westward. Wine country ends not far beyond the horizon. 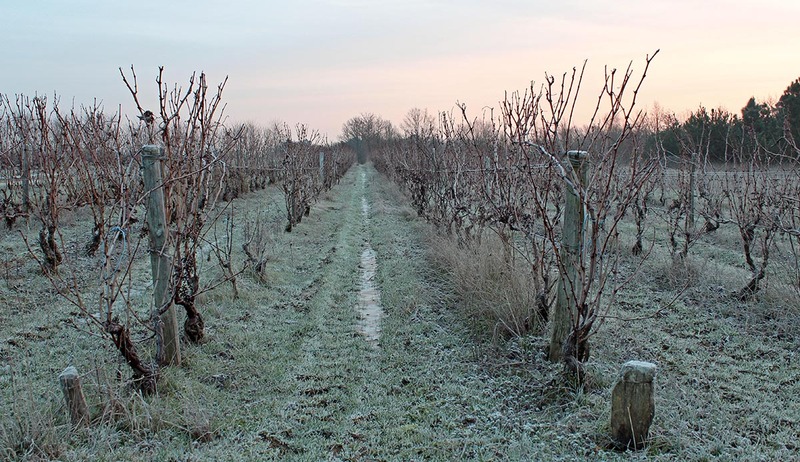 So I'm back to showing you photos of the frosty vineyards out behind our house, taken not long before the snow came. I've had grand plans to take the camera back down by the river one of these days, but the ground is so saturated that I wouldn't get close before sinking knee-deep in mud. 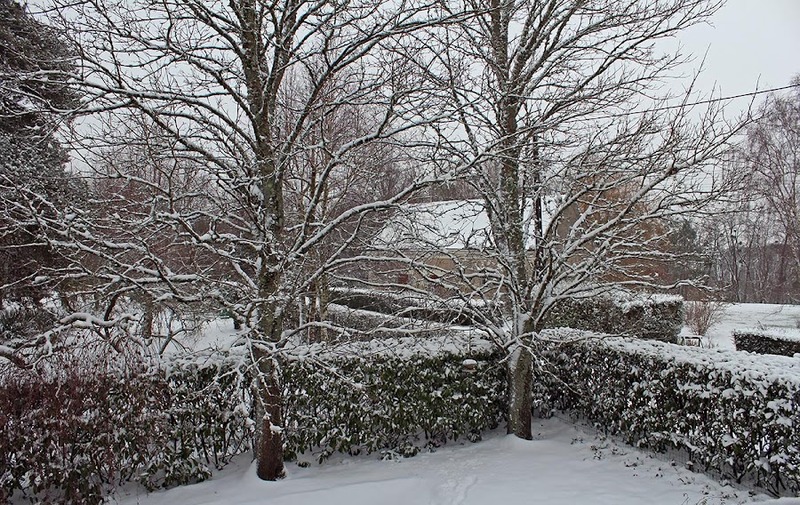 Except for walking the dog and chopping wood for the fire, Ken and I stayed indoors all day watching it snow. We didn't get much, but enough to keep us from attempting the hill with the car. No one else attempted it, either, until one brave soul drove down mid-day. The view from our living room early Sunday afternoon. The plow didn't get up to clear the road until late in the afternoon. By then we had made apologies to friends who had invited us for dinner, not knowing when the snow would stop or how the roads would be. We decided to be prudent and to not drive after dark, after dinner, and after wine, in this weather. Pretty much the same view, but with the deck visible. Today we're expecting more precipitation, but are unsure of what form it will take. They say we will likely have more snow, but also some rain and some freezing rain. I guess that's what they call a "wintry mix." The weather is much worse north of us, toward Paris. The news is full of stories of delays and stranded travelers, and the airports are a mess, too. All this for less than six inches of snow. This is the dirt road through the vineyards that leads to our house. It's where Callie and I walk on our morning outings. Normally we walk out to this point and turn back again. But once in a while we continue on through the vineyards beyond this intersection. Callie knows which way is home. She's sniffing around waiting for me to finish taking photos. At bedtime Saturday night we were still getting light rain. But overnight the temperature fell enough to change the rain to snow and we have some accumulation this morning. We'll have to wait until light to see how much and what the condition of the ground is underneath. The snow is supposed to continue falling through mid-day. 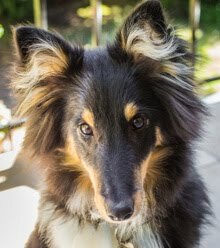 It's Ken's turn to walk Callie this morning so I'm sure he'll get some good photos before I get out there. As I type this (on Friday afternoon) we are waiting for snow. We are on the edge of the weather system, so we could get snow or we could not. I'll let you know. Saturday's forecast is more threatening with a bunch of snow predicted. Again, it might happen. But then again, it might not. 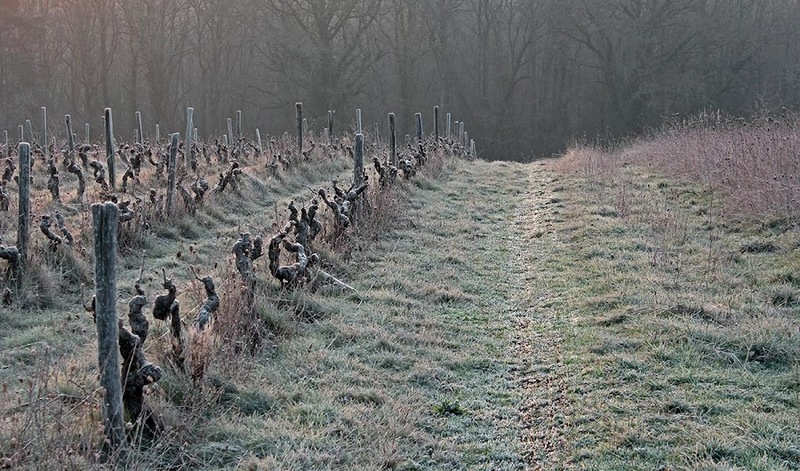 Frost in the vineyard. No snow yet. The accumulation that the weather people forecast for Saturday night is a bit scary. At least for us. I will certainly be surprised if we get that much snow. Again, I'll let you know, as long as we have power. Ugh. Don't want to go through that. But we're prepared. We've got wood for fire (and therefore heat) and plenty of food (and wine) to get us through if we can't get the car out. 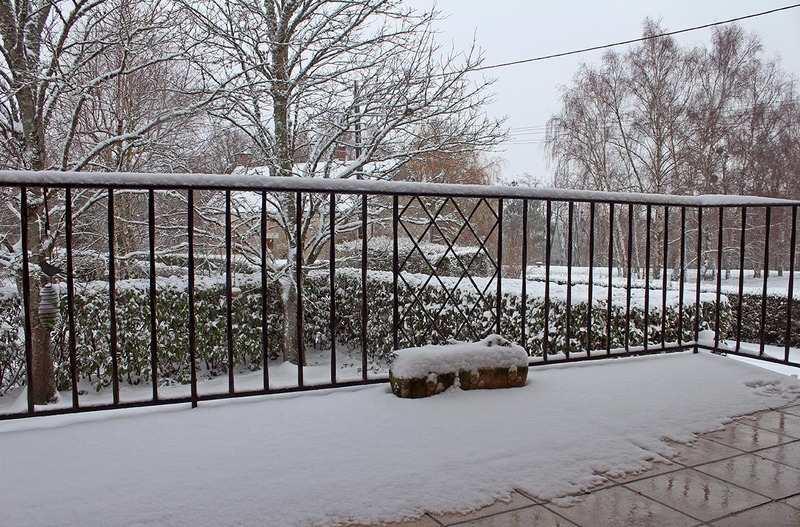 Mind you, for those that live in winter climes, the amount of snow that would keep us in is laughable. But around here it would be a lot. UPDATE: This morning we are having freezing fog. All ground surfaces are slick... walking the dog was a bit tricky! 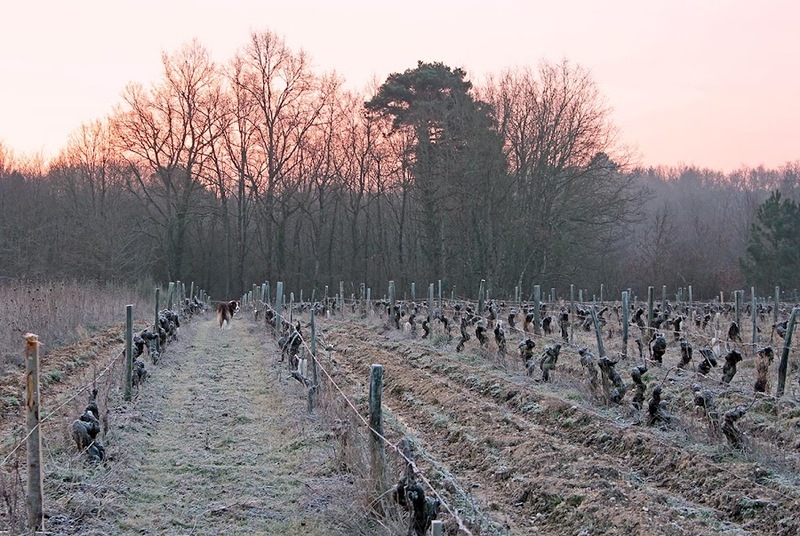 Yesterday morning it was about -5ºC or colder out in the vineyard. I bundled up and took Callie for her walk just after sunrise. The air was absolutely still; no wind at all. Even though it was cold, it wasn't a biting cold. The rising sun warms up the tops of the vineyard posts. As always, click on the photo to embiggen. Callie doesn't mind the cold at all. She has a nice fur coat. We stayed out a little longer than usual and took a few detours for photos. Callie always likes getting off the beaten path. 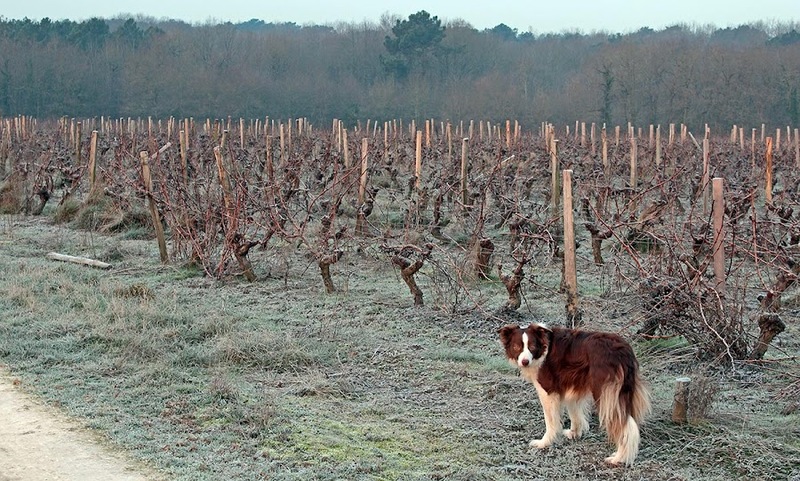 Get ready for a series of photos from the winter vineyard. Our mild winter has given way to actual winter. This morning is the coldest so far this season at minus four celcius. That's measured at our house, which will typically read just a little warmer than temperatures around us because the thermometer is attached to the garage wall of the house (outside, of course). Even though the garage is not heated, it's probably a tad warmer than the air out in the vineyard. Some dark clouds roll by to our north. The sky is clear now, so we're much colder. Still, it's cold. And it's predicted to stay that way for at least a few days. We're expecting some snow over the weekend. We have yet to see how much we get (it won't be a lot) and how long it sticks around. I've pretty much exhausted my pictures from 1994 when I visited the top of the World Trade Center for the last time. Here's a ground shot taken from Battery Park City. The twin towers in 1994. It was the last time I saw them. I'm hopeful that there will be some sunny days ahead and that I'll be able to take the camera out. The days are lengthening, but slowly, and walks with the dog are still often in twilight conditions, especially when it's overcast. 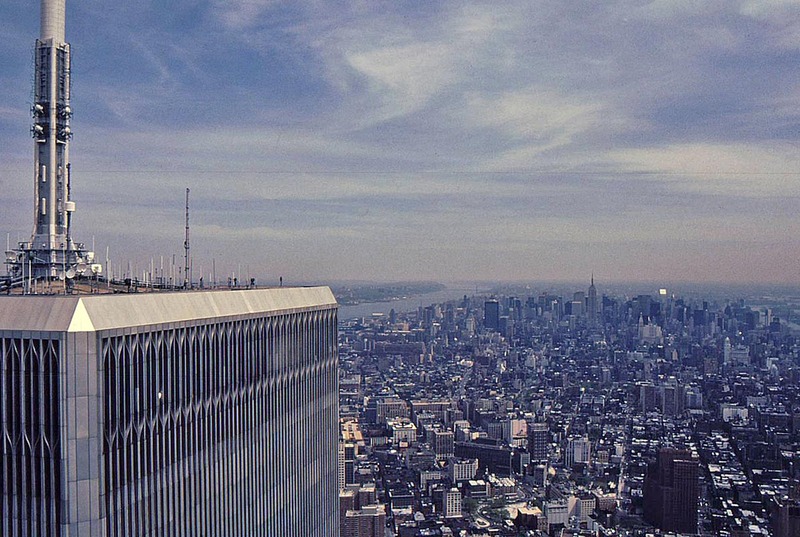 Yet another shot from the World Trade Center's observation deck taken in 1994. This is the rather austere plaza at street level, seen from above. I think it was visually impressive and worked geometrically, but it wasn't a very inviting place to be, if memory serves. 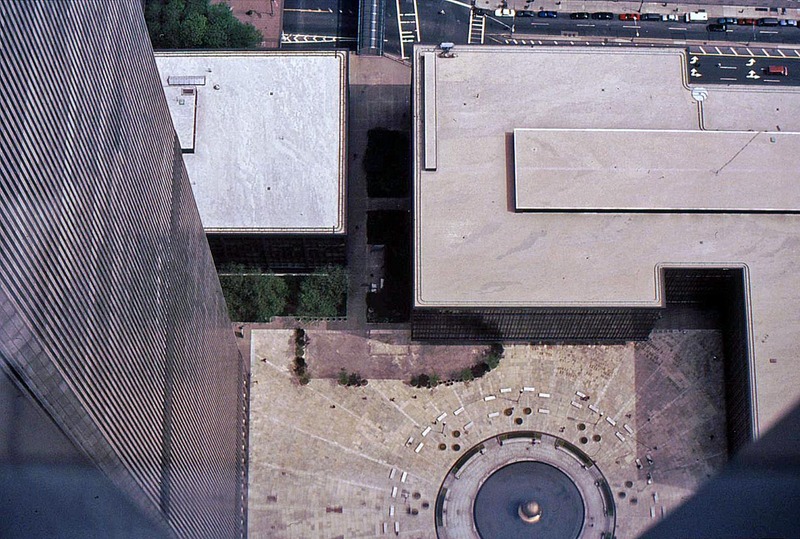 Looking down at the World Trade Center's plaza. Most of the center's ground level activity took place below the plaza in a huge concourse and network of tunnels that connected a rather large retail space (shopping mall) with the surrounding buildings, the subway, and the PATH trains to New Jersey. The sculpture in the fountain, called "The Sphere," was damaged but not destroyed on September 11, 2001. It was recovered and moved to Battery Park as a memorial. The damaged sculpture is intact, but it has not been repaired. I didn't know about this until now. Isn't the internet cool! One day I would like to go back and see how the new Trade Center spaces work, after the construction is completed. Since I'm from upstate and go back now and then, a side trip to Manhattan is not out of the question. Jimmy Dean, Jimmy Dean. Ok, that's an obscure reference. 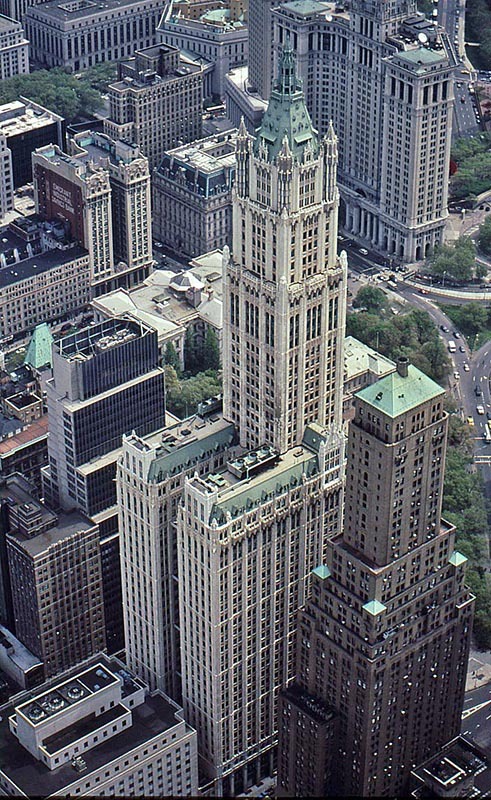 This is the Woolworth Building in lower Manhattan, seen from the observation deck of the World Trade Center in 1994. The architect was Cass Gilbert and the building was finished in 1913. One of the tallest skyscrapers of its time with fifty-seven floors, it remains an icon among tall buildings. The back side of the Woolworth Building as seen from the observation deck of the WTC. Wanna buy a bridge? It's in good shape, and such a deal! The old joke has been around probably for as long as the bridge itself. This is a view of the famous span from the observation deck of the World Trade Center back in 1994. 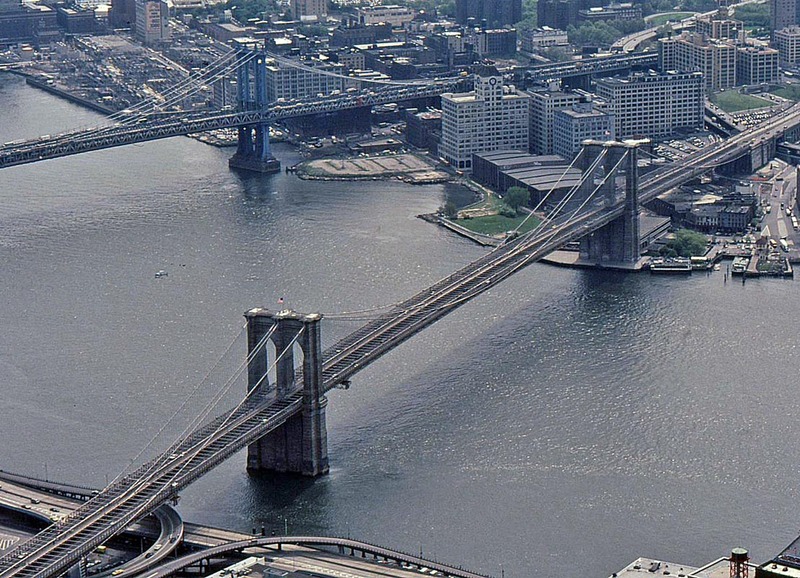 The Brooklyn Bridge (bottom). You can see the east tower of the Manhattan Bridge at the top. The Brooklyn Bridge was built in 1883 to connect lower Manhattan to Brooklyn across the East River (which is not really a river but a tidal strait). While I have crossed the bridge in a car, I've never walked across. That's something I'd like to do one day. This is another in a series of old slides I'm scanning. One day the weather will be nice enough for me to go outside and take some more pictures! Here's another photo from nearly twenty years ago taken from the observation deck of the World Trade Center in New York City. I remember being fascinated when Battery Park City was built. They filled in a section of the waterfront, eliminating old and outdated piers, creating new land for the new neighborhood. 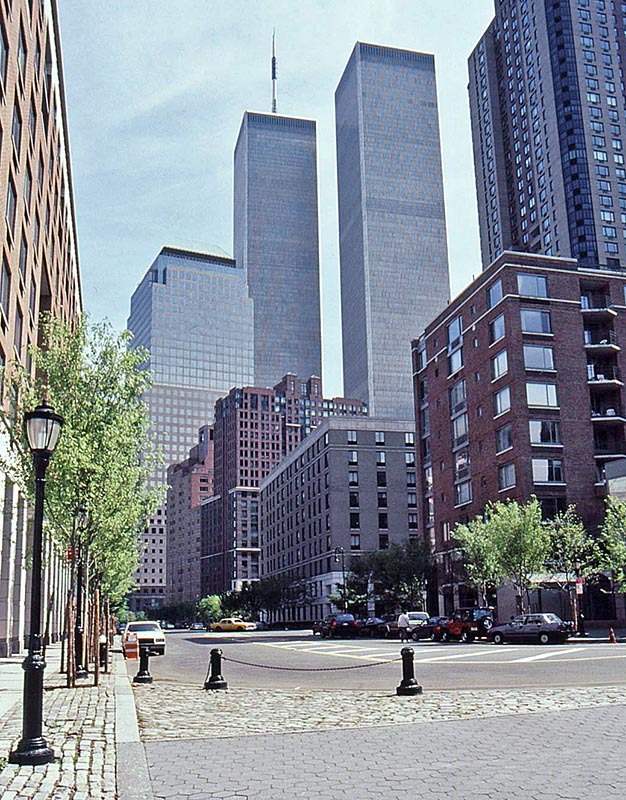 The core of the development is the World Financial Center (pictured here). Each of the buildings is topped with a different roof: a dome, a pyramid, and a stepped pyramid. 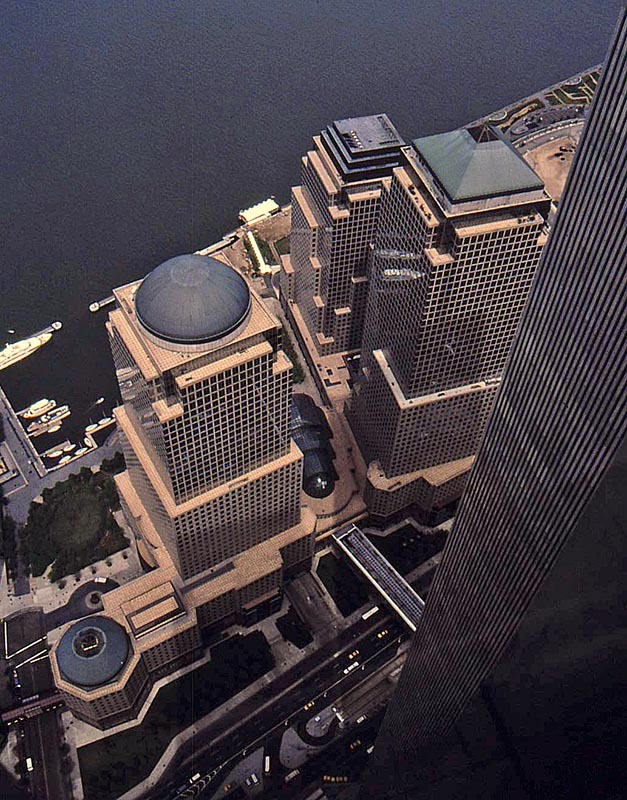 The World Financial Center, designed by César Pelli, seen from the World Trade Center in 1994. Today the place is a thriving mix of office, residential, and public spaces. I'm sure the people who live there will be happy when the new World Trade Center, just across the street, is completed. I took the picture through a window on the observation deck. 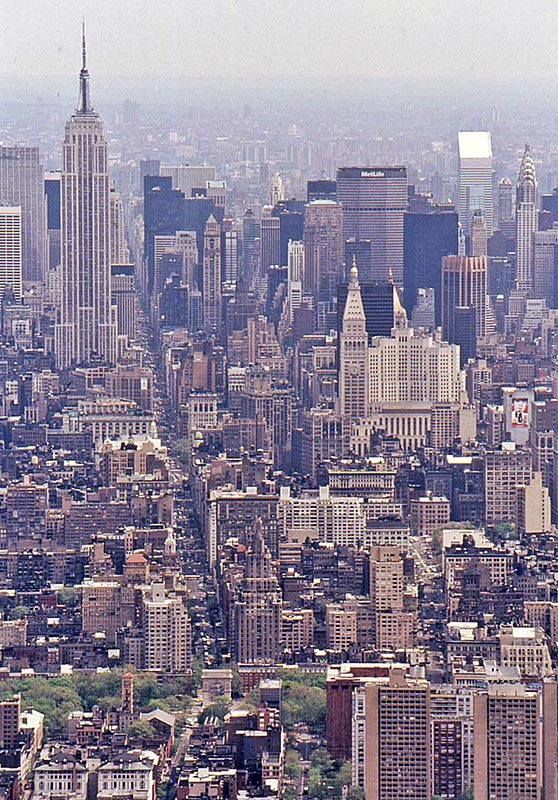 This is another view of midtown Manhattan looking north from the observation deck of the World Trade Center when I visited there in 1994. You can clearly see several iconic landmarks, including the Empire State Building (on the left) and the Chrysler Building (on the right). A zoomed-in view looking up 5th Avenue in Manhattan. The most visible avenue in the image is Fifth Avenue which ends at Washington Square Park in Greenwich Village. It runs by the Empire State Building at 34th Street. The distance from where I took the photo to the arch in Washington Square Park (visible at the bottom of the photo) is roughly two miles (3 km); the Empire State Building is just over a mile further north. Remember, this is an old color slide that I scanned for the blog. In 1994 while living in the San Francisco Bay Area, I took a trip back to upstate New York to visit family and friends. During that trip, I rode the train down to Manhattan for a day to do touristy things. I went to Central Park, the Museum of Modern Art, and the World Trade Center, among other things. Looking north. You can see the Empire State Building and Citicorp Center up in Midtown on the right. This was not the first time I had been up to the observation deck of the WTC, but it was to be my last. We all know what happened seven years later. At that point in time I was taking color slides. I scanned a few of the slides from that trip and this is one of them. The photo loses some quality in the scanning, but I still like it. Especially because of the Trade Center. Those buildings were cool. 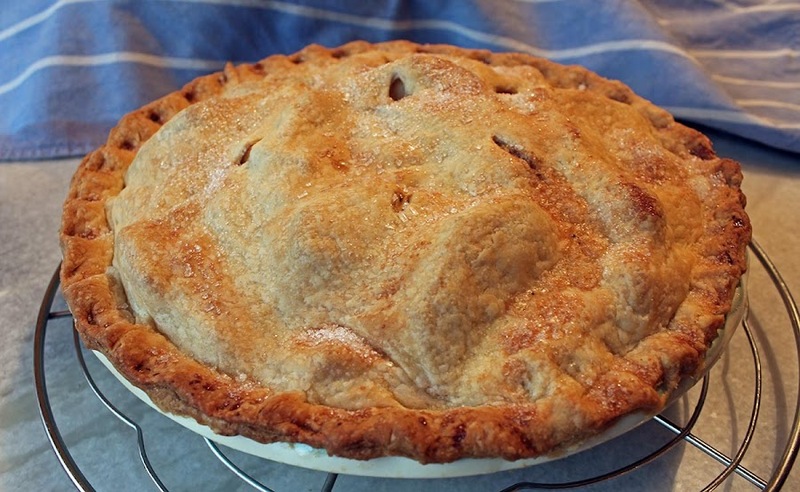 ...apple pie. 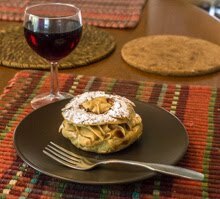 I had a bunch of apples in the cellar screaming to be used, so I decided to make an apple tart. 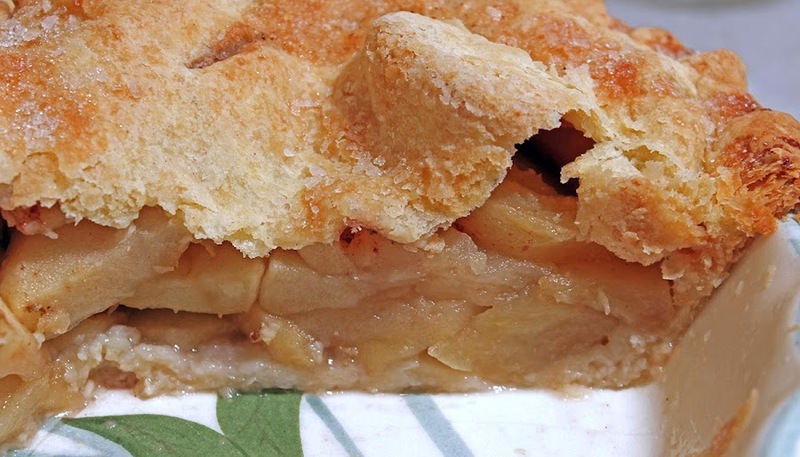 Ken suggested I make an American style apple pie instead. A pie with a top crust. So I did. It was a good way to use up all the apples. I don't make this style of pie often, but it's nice once in a while. I used less than a half cup of sugar, and just a soupçon (how many times do you get to use that word?) of spice: cinnamon, clove, and nutmeg. Another word I could use to indicate a small amount would be une pointe of spice. We ate about a third of it. More for today! Too much cinnamon and the pie would become, as one of my friends calls it, une tarte à la canelle (a cinnamon pie). I like the spices, but I also like to taste the apples. Note from the front office: I hate typos. I make lots of them and I frequently manage to publish my post before I find them all. Today I noticed two spelling mistakes more than an hour after publishing. How embarrassing! They're fixed now. Our current weather pattern is not really motivating me to get out to take pictures. It's dark and gray. I walk Callie either in the morning before it gets fully light or in the evening as the light is fading. The overcast makes it even darker. So, until it lightens up a bit, I'll share this photo from last May when we spent an afternoon in Plymouth, Massachusetts. Pleasure boats anchored in Plymouth harbor, May 2012. This is the harbor at Plymouth. The day was a Saturday and the weather was spectacular. Lots of people were out enjoying the warm sunshine, including us. We were on our way to Boston for our flight back to France after two weeks in the USA and Canada. To mark the epiphany, people in France eat a special cake made with puff pastry filled with an almond paste called frangipane. The cake is called une galette des rois (cake of the kings), the kings being those three wise men who took gold, frankincense, and myrrh (myrrh? To a baby shower?) to Bethlehem. 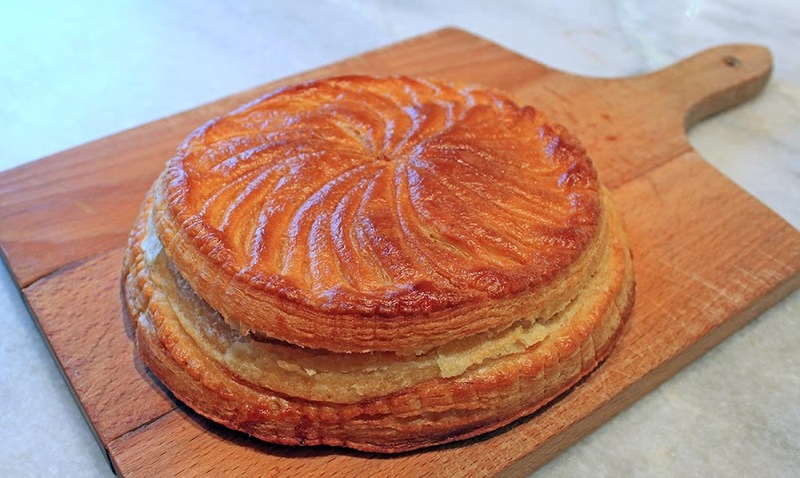 The galette traditionally has a little prize hidden inside it and the person who gets the prize in his slice is crowned king for the day (the cakes are sold with paper crowns). The bottom came out a bit larger than the top, and there was some separation of the two layers. But that didn't affect the taste. Galettes appear in the bakeries and supermarkets after the new year (sometimes before) and range in price from the affordable to the ridiculously expensive. Years ago, Ken and I decided that our local galettes were getting much too expensive (it's a huge racket any more) and that I should make our own at home. The biggest time investment is in making the puff pastry. After that the cake goes together pretty easily. I used a sweet chestnut cream filling in place of the almond for a change. It was delicious! I'll probably make another in the next few days. That'll take care of January's special food. Then we have crêpes to look forward to in February. The days are dark and gloomy right now. Low clouds, drizzle. Monotonous. It's called la grisaille; a pretty name for boring, dreary weather. Not at all like this photo of the sunrise a week or so ago. At some point this high pressure will fade and we will once again see some breaks in the clouds. We're not even seeing small patches of blue like this right now. 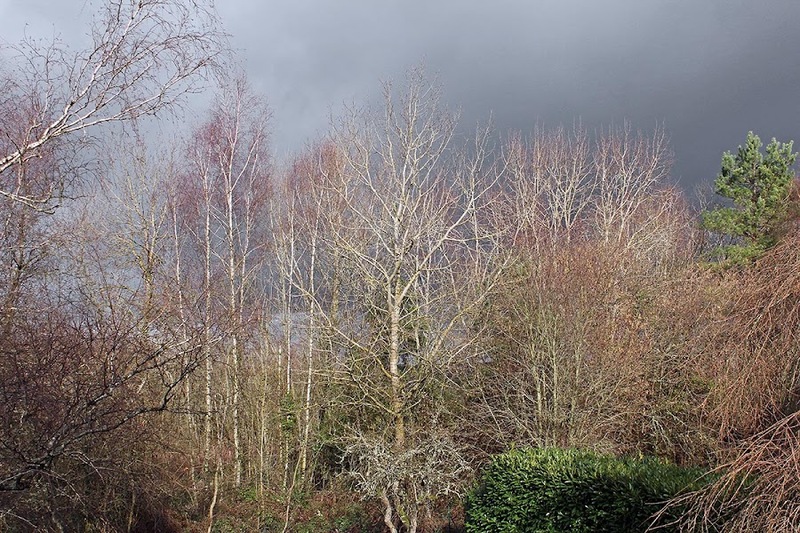 Of course, that will also mean more changeable weather with the possibility of lower temperatures and snow. Well, it is winter, after all. Long time readers might remember that I collect daily temperature and rainfall data at our house. I wish I could say that I have sensors that transmit the information directly to my computer, but I can't. I actually look at the thermometer and record, with a pencil, the daily high and low temperatures. I also have a rain gauge in the garden that I look at and empty whenever it rains. Not very high tech. 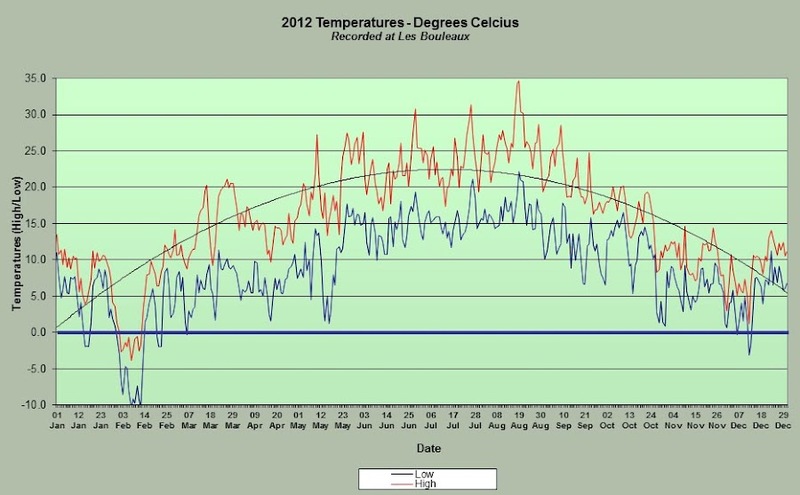 Daily high (red) and low (blue) temperatures at our house for 2012. Click to celcify. 25ºF is about 75ºF, 35ºC is about 95ºF, and 0ºC = 32ºF (freezing). You can clearly see in the chart above those few weeks in February when we were below freezing every day. That's a rare occurrence here. Also, our mild December weather after a chilly start is obvious on the extreme right-hand side. The arc is a trend line for the high (red) temperature. I'd like a more automated way to do this, but the system I use works for now. The thermometer, at least, is electronic and has a console in the house with a sensor outdoors. The sensor does transmit, via radio signal, the temperature as it changes throughout the day. The console remembers the highest and lowest temperatures, but I do have to remember to reset it daily. Monthly rainfall totals for 2012 at our house. Click to pluvioumetrate. 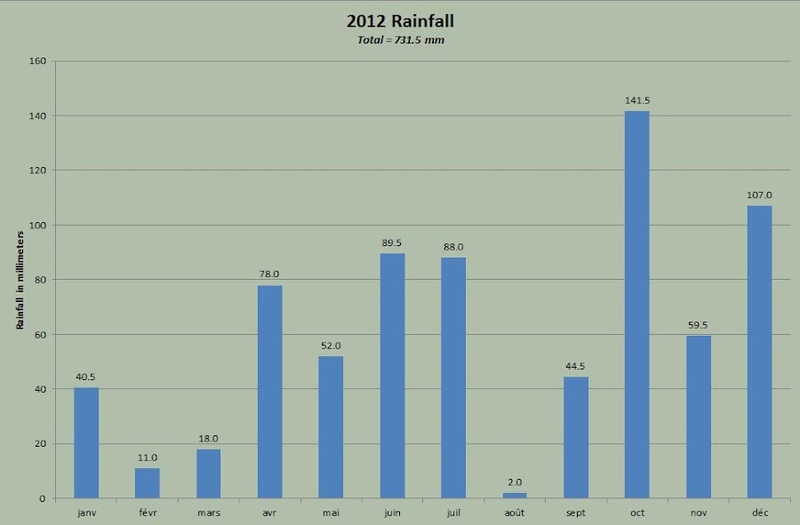 25.4 mm = 1 inch, so 731.5 mm is just under 29 inches of rain for the year. The rain gauge is more simple. It's a plastic graduated cylinder that I have to read and empty by hand whenever there is rain. Snow is more problematic, but I've worked out my own method for that. You can see above that October was our wettest month last year, while August was quite parched (August was also our hottest month. How 'bout that!). I've been tracking this data for seven years, so I have somewhat of a historic record. I'll spare you all of that. Once a month, I transcribe the data from paper to an Excel spreadsheet (my years of university and career were good for something) and manipulate it into all manner of charts and graphs. Ain't retirement grand? A gratuitous shot of the cabane du vigneron (the storage shelter out in the vineyard) on a recent sunny morning. 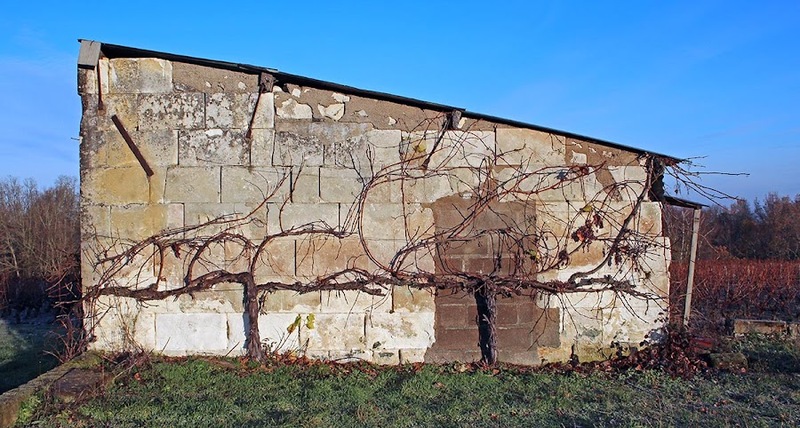 Grape vines grow against the sides of the abandoned shelter. I've never seen anyone open the padlocked door. Our mornings are not sunny right now. We have a classic winter high pressure system over us that is keeping the clouds pressed to the ground. It's dark and gloomy and wet. Still, the temperatures are quite mild. One of the projects that Ken and I planned for this winter is ripping all of our music CDs into electronic form and putting them into iTunes. That way we can just play music through the computer. 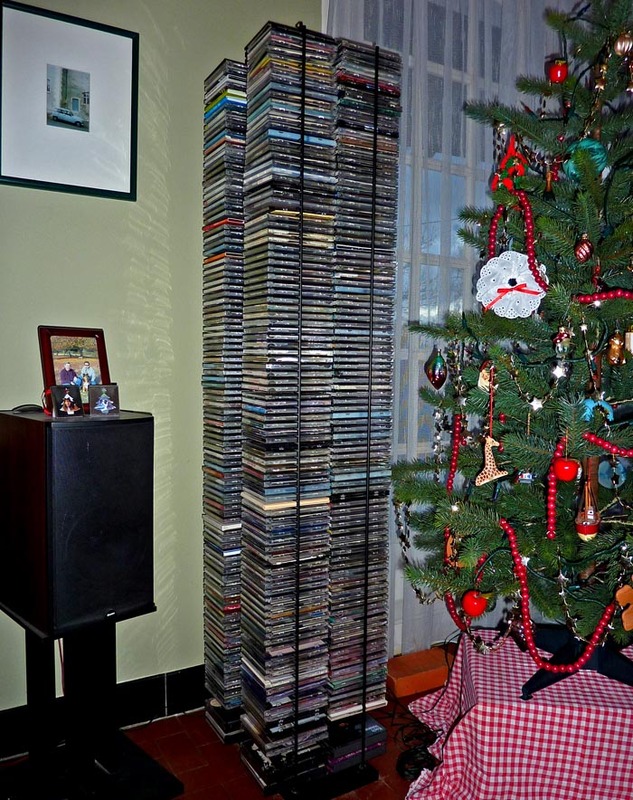 The goal is to box up the physical CDs and put them into storage so they're no longer taking up space in the living room. Getting started with the sorting and alphabetizing. I'm putting the discs in wine boxes, like those you see on the upper left. Ken started the ripping process a few weeks ago and just finished doing them all. According to the database, we have over 8,000 song titles, almost 750 CDs in all. It's not a huge collection, but it was still a big job. So now I've started the process of boxing up the discs. I'm trying to carefully sort through and organize them so we can get to them should we need to. 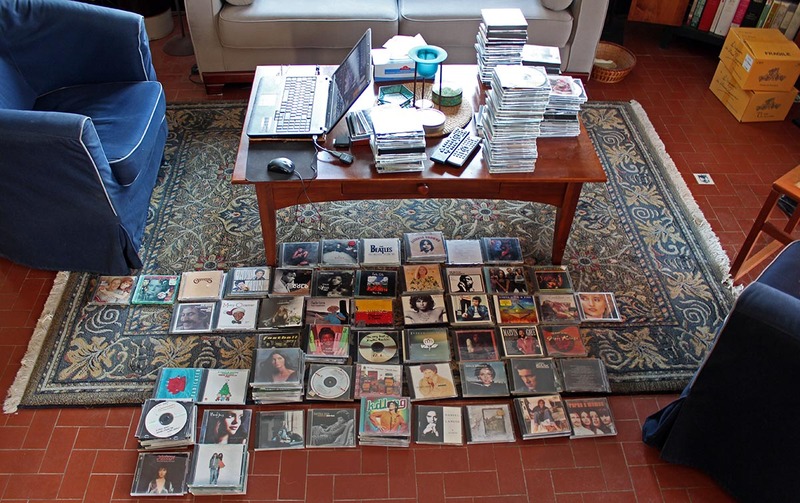 That means keeping English and French language albums separate and alphabetizing the collection by artist. I'm also keeping classical music, soundtracks, and multi-artist compilations separate. I've packed up about five boxes so far, just under half the collection. I need more boxes. She's not that hard to see in this picture, but she's frequently darting in and out of the tall grass and under the rows of vines on her walks. As the vines get pruned, it's easy to keep track of her movements. In the summer, when the vines are leafed out, she can disappear on her little exploratory forays. Callie pokes her head up to make sure I'm following along. But she's never far from me. If she can't see or hear me trudging along, she'll often turn back to look for me. Can't you keep up, you silly human! Here's another shot of the last decent sunrise of 2012. It's still dark on Tuesday morning as I type this, so I don't know what kind of sunrise we'll have this first day of the new year. I can see the moon peeking out from around the clouds out there, so we may see some sun later on. Best wishes to all of you for great 2013!